If the West is holding on to the fading light of its once proud appellation, “The Wild West,” then Wyoming is one of the final strongholds. Its terrain is harsh and unforgiving: the plains collide boldly with mountains, raging rivers, and cataclysmic lightning storms. Cowboys and Native Americans still make up much of the population here, the land is open and untamed, and the great ungulates of the American west—bison, elk, moose, pronghorn, and big horn sheep—still roam free. It’s not that Wyoming has escaped everyone’s notice. Yellowstone, after all, was the first of the country’s National Parks (there are now 58 and counting). Wyoming’s iconic mountains, including the Grand Tetons, the Bighorns, the Wind River Range, and Devil’s Tower, are home to some of America’s most dramatic mountain scenery. Jackson Hole is one of the most highly regarded ski resorts in the nation. So it may come as a surprise that Wyoming hadn’t ended up a bit more like, say, Colorado. The truth is, Wyoming is more rugged and wild. The winters are harsher and summers often hotter. Water is extremely scarce. Instead of Colorado’s subdued farmland, Wyoming’s rough terrain is better suited to free-range grazing. Hence, instead of industrial-scale farms forming tessellations of circles and boxes across the landscape, most of Wyoming’s land remains open and organically composed. In lieu of pine forests, the prairie continues right up to the base of dramatic mountain ranges that rise abruptly out of the ground. Those who did settle here had to be hearty and bold, and work the land as it wished to be worked. The grand result of Wyoming’s harshness is an outdoors paradise, and getting “out there” in this state requires little more than stepping off the interstate. The Bighorn Mountains, for example, offer countless opportunities for backpacking, climbing, mountain biking, fly-fishing, and hunting (with appropriate tags), yet they will likely remain forever thwarted by the state’s two major national parks: Yellowstone and Grand Teton. For rock climbing, most people stick to the Grand Tetons and Devil’s Tower—an explosion out of the planes of uplifted columns of vertical rock—in lieu of ever stepping foot in the Wind River Range, which has some of the lower 48’s most impressive walls of sheer granite. Without a doubt, Grand Teton and Yellowstone National Parks are well worth seeing, crowds or no crowds. The Grand Tetons form a serrated series of razor sharp peaks that rise like thunderheads out of the plains, and they are some of America’s most iconic scenery. 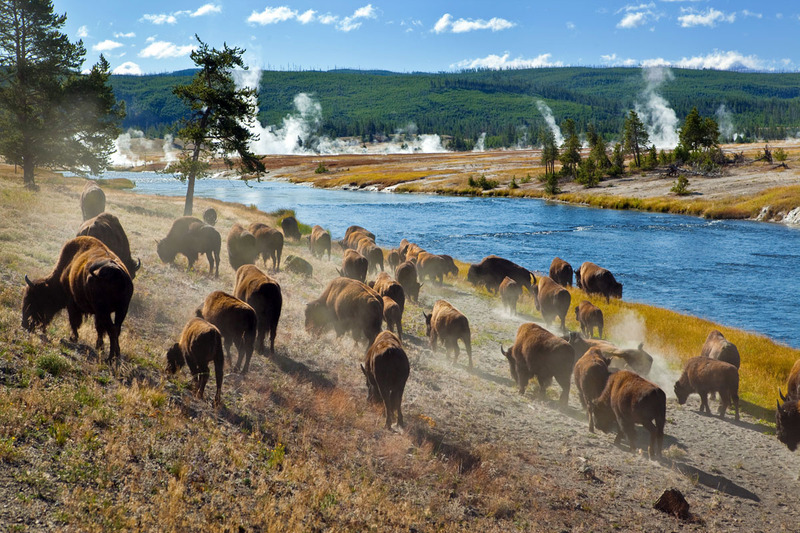 Yellowstone features not only some of the United States’ best wildlife viewing opportunities, but also some of its most bizarre landscapes. The Park sits on top of the enormous Yellowstone caldera (or “supervolcano”), an internationally known hotspot of thermal activity. As a result, visitors to Yellowstone have the chance to see vibrantly-colored pools of steaming mineral water, Dali-esque geological formations, bubbling hot mud, and huge spouting geysers (Old Faithful, being the most famous). With lupine-filled alpine meadows, cool rivers full of trout, towering peaks, active geysers, bison herds crossing the road in front of your car, grizzly bears, and wolves, Yellowstone and Grand Teton offer wilderness that few other national parks, if any, can rival. 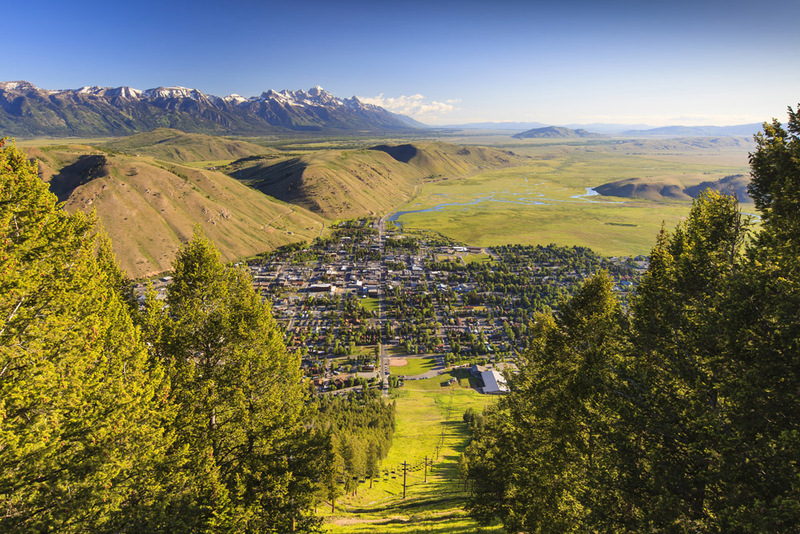 For those looking for a basecamp, the town of Jackson—located in the scenic Jackson Hole Valley—offers good food, fantastic breweries, popular music venues, and one of the country’s premier ski resorts. Located just 30 minutes outside of Grand Teton National Park, and 2 hours from Yellowstone National Park, Jackson is a great place to start of finish your Wyoming adventures, be it hiking, skiing, fly fishing, rafting, bird-watching, or anything else. Whatever type of adventure you are seeking, Wyoming can likely provide it.